Our wee festival is probably the smallest and most intimate traditional music festival in Scotland, as the island Village Hall where we hold our headline events has a capacity of about 150. Many of our festival-goers are regulars: we know them by name, and they're always welcome to have a blether while booking their tickets. 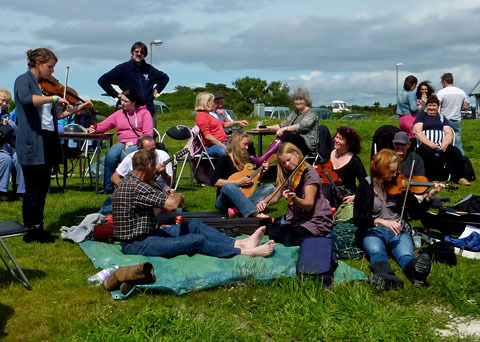 The Isle of Gigha Music Festival takes place over the last weekend in June every year. We have a festival supper, concert and then ceilidh dance on the Friday evening. During Saturday we run a number of sessions and open mikes, put on a raft of music and poetry workshops, and hold a Gigha crafts fair. There is a late afternoon barbecue at The Boathouse followed by our headline evening concert. There are usually sessions in the Hotel on Saturday evening till late. On Sunday we have an afternoon Pipers' Picnic – a beach session and an evening Survivors’ Session at the Village Hall. All our Village Hall events have a late bar. Refreshments are available at all Village Hall events. We welcome musicians of all abilities to our festival – learn or improve at a workshop, play or sing at a session or open mike. Do bring your instruments with you. 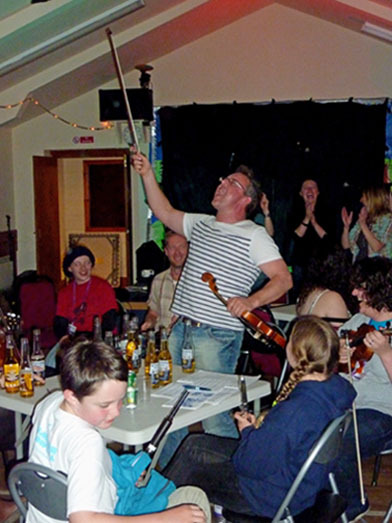 The Isle of Gigha Music Festival holds the undisputed world record of 65 minutes for a non-stop Orcadian Strip the Willow. Some 50 persons danced throughout the set by Heuch! at our tenth anniversary festival. | Our Facebook Page | Copyright © Aglarond Design 2017. All Rights Reserved.